Anyone who thinks that banana bread qualifies as actual bread is kidding themselves. Banana bread is, without a doubt, a form of cake. This noble recipe is groundbreakingly, unabashedly honest about what it is and so is baked in a cake pan, further accentuating its true identity. Also, I don’t own a loaf pan, so there’s that too. ground cinnamon $1.50 for 1 oz. Preheat oven to 350 degrees F. Lightly butter an 8" round or square cake pan. Set aside. Whisk together the sugar and butter until fluffy. Whisk in egg, milk, bananas, 1/2 tsp cinnamon, flour, baking powder, baking soda and salt. Continue stirring until batter has been fully incorporated. Scoop out about 1/3 cup batter and transfer to a small bowl. Use a rubber spatula to scrape the remaining batter into the prepared pan. Whisk reserved 1/3 cup batter with honey and 1 1/2 tsp cinnamon. It should be dark brown in color. Use a spoon to drizzle the dark batter in a spiral over the regular batter. 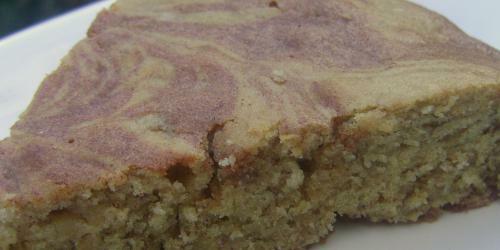 Drag the blade of a butter knife over the batter to create a swirly, marbled look. Bake for 22-26 minutes, or until a knife or toothpick inserted into the center of the cake comes out clean. I made this yesterday and it was DELICIOUS. I kept checking on it and pulled it out of the oven at the perfect time (about 20 minutes in my oven) and it was moist and flavorful! I also made a glaze and put it on top afterwords to make it even more decadent! Thanks for the easy to follow recipe! Will be serving to guests with coffee this weekend! This was a very easy cake to make and it turned out to be moist and cake-like as it was described. The best part was taking it to our Thanksgiving dinner where it was devoured very quickly and left the ole favorites sitting on the table looking very sad!! We gave some to our guests to take home but no one asked for the sad pies to go with them! I loved the fact that the ole ripe bananas had worked out so well for me (They had been in the freezer). Thank you, Gabi, I will definitely make this again, especially when I have left over bananas, which I had almost thrown out! It is the amazing post forever here the best window for the web users most people connect the online every where window 10 it is the use your redirect on the folder get the type of tricks to your work better.